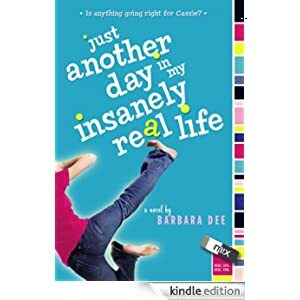 Twelve-year-old Cassie has a lot to cope with when her father moves “out of the picture.” Her mom’s constantly working overtime, her teenage sister’s going AWOL, and her little brother seriously needs attention. It’s up to Cassie to prevent total chaos at home — or so she thinks. She can’t control everything, though. At school Cassie’s two “best” friends are turning nasty, and a cute boy is sending mixed signals. And then there’s Mr. Mullaney — the weirdest, hardest English teacher in the seventh grade — who hates everything she does. Since Mr. Mullaney isn’t even reading her brilliant work, Cassie starts submitting journal entries like “A Virtual Tour of My Insanely Messy Desk.” But her sassy humor isn’t winning her any friends or helping her ailing grades. What’s a girl to do when life gets totally insane? This book is for readers in grades 4-7 and is selling for only 99 cents today.